・Dave Enright will appear on television. Hi, my name is Hibiki and I’m doing an internship at Evergreen Outdoor Center in Hakuba. As mentioned in the title, Dave Enright, the owner of Evergreen Outdoor Center, will appear on BS-TBS at 8 p.m. on June 21st! I accompany TV shooting with Dave and camera crews today. I went to Happo Ridge with them. It was 5℃ and really cold on the mountain, and there was some snow on the top of the mountains. 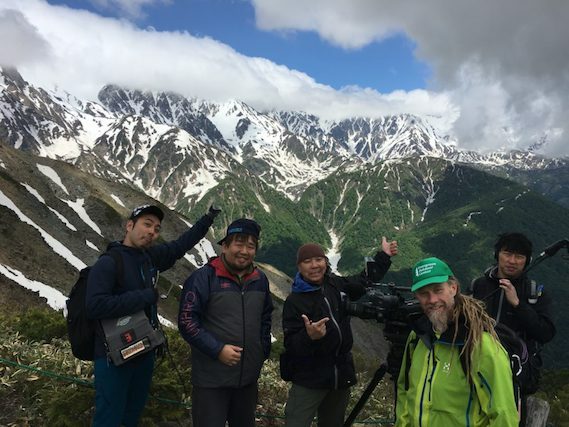 Dave talked about the history of Hakuba and how important nature is. His story was really interesting, and I thought that through Evergreen’s tours, he is trying to protect nature and at the same time show how amazing Hakuba is. The camera crews listened attentively to his talk, so I think this TV program will definitely be interesting. If you are in Japan, you can watch it on BS-TBS at 8:00 p.m. on June 21st. Also, if you venture off on one of Evergreen’s hiking tours, you may be able to see the beautiful scenery like the picture! If you are interested in doing some hiking tours, please check the link below! !